This model runs in COR and OpenCell and the units are consistent throughout. The model does not currently reproduce the published results, possibly due to missing parameter values in the paper. ABSTRACT: Glycerol, a major by-product of ethanol fermentation by Saccharomyces cerevisiae, is of significant importance to the wine, beer, and ethanol production industries. To gain a clearer understanding of and to quantify the extent to which parameters of the pathway affect glycerol flux in S. cerevisiae, a kinetic model of the glycerol synthesis pathway has been constructed. Kinetic parameters were collected from published values. Maximal enzyme activities and intracellular effector concentrations were determined experimentally. The model was validated by comparing experimental results on the rate of glycerol production to the rate calculated by the model. Values calculated by the model agreed well with those measured in independent experiments. The model also mimics the changes in the rate of glycerol synthesis at different phases of growth. 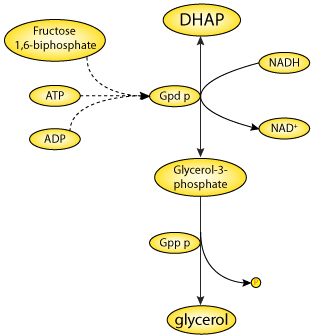 Metabolic control analysis values calculated by the model indicate that the NAD(+)-dependent glycerol 3-phosphate dehydrogenase-catalyzed reaction has a flux control coefficient (C(J)v1) of approximately 0.85 and exercises the majority of the control of flux through the pathway. Response coefficients of parameter metabolites indicate that flux through the pathway is most responsive to dihydroxyacetone phosphate concentration (R(J)DHAP= 0.48 to 0.69), followed by ATP concentration (R(J)ATP = -0.21 to -0.50). Interestingly, the pathway responds weakly to NADH concentration (R(J)NADH = 0.03 to 0.08). The model indicates that the best strategy to increase flux through the pathway is not to increase enzyme activity, substrate concentration, or coenzyme concentration alone but to increase all of these parameters in conjunction with each other. Schematic diagram of the glycerol synthesis pathway in Saccharomyces cerevisiae. Derived from workspace Cronwright, Rohwer, Prior, 2002 at changeset 77f16fab0f6e.